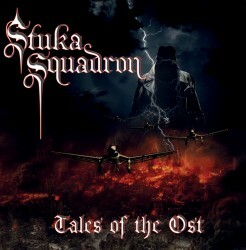 Stuka squadron are a London based band that combine World War 2 Germany with Vampires (seems obvious really doesnt it). They wear long German miltary leather coats, Iron Crosses, and Luftwaffe caps as well as displaying Vampire fangs to create a striking image. A striking image though is nothing without having the music to go with it, and Stuka Squadron aren't lacking there either - they're a damn good live band, so I was looking forward to listening to the album to see how they sound. Well after a couple of listens I'm not disappointed - this is a great album. Comments on a couple of the songs..
"Stuka Squadron" has a strong Iron Maiden feel to it at times, and is another great track. Zabulons inferno has a good heavy opening and a great catchy riff to it - a very good song. The last track on the album is in my opinion, the best song here - it's a perennial favourite from their live shows - "We drink blood". A really good song that like most of the album is best played LOUD ! My main criticism is of the production. Most of the time, everything just feels a bit flat and muted, but thats probably down to a low budget, and the album is good enough for this to be a minor issue really. There's definitely a feel of early Iron Maiden albums to a lot of this album, which is certainly no bad thing. The vocals are great and reminiscent of Bruce Dickinson at times, and the album is full of superb guitar work. An excellent debut album from Stuka Squadron - buy it, and make sure you check the band out live - they're great fun and the songs sound best played live at ear-splittingly loud volume ! I came across these guys by pure accident. It was the best accident I have ever had. The guys are great. The music shows promise. Traditional heavy metal fused with the growing fascination of vampires and the undead and the occult. Lovecraft is among my favorites. It captures the love of the writings of HP Lovecraft and the occult. My father is a World War II expert and I knew right off the purpose of the Stuka dive bomber. An ingenious weapon that should never have been in World War II but due to a very minor modification (front cannons) it became a flying demon of destruction. Just like the boys from Stuka Squadron. They completely merged opposites and unrelasted to create a masterpiece of classic metal that was thought to have died off due to the vast array of metal music out there. It is like a vampire rising from its coffin to spread its fangs and wings and take over the music world in its own undead fasion.